I like to start my 100 Day projects on January 1st because (except for leap years) my birthday falls on the 100th day of the year, and it feels perfect to sandwich this type of project between two key dates. I have spent the first twelve days on the design process. I will spare you every process photo, but here is an overview of the design process. I wanted to give the turkey a certain amount of formality, so I spent a lot of time looking at art books, and ultimately decided to place the turkey in an archway with a checkerboard floor. The inspiration for this design ranges from Renaissance paintings to 20th century Rock and Roll posters. 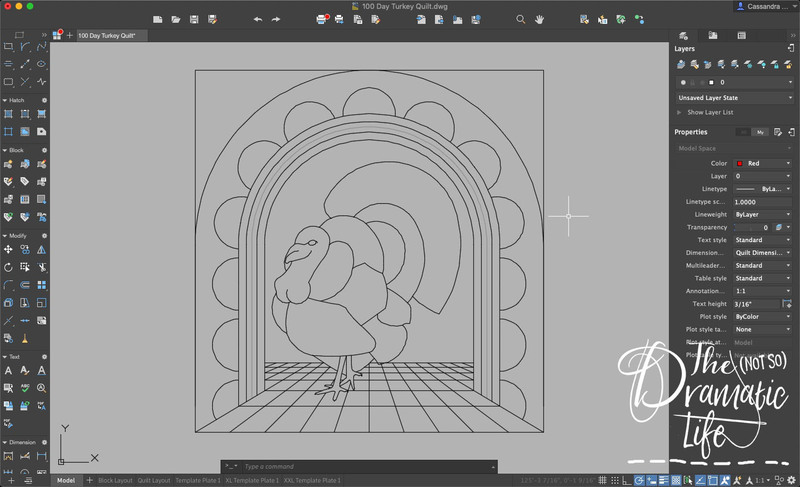 Most of the design process has taken place on AutoCad Lt.
After looking at a lot of turkey images, I sketched out a large wild turkey. 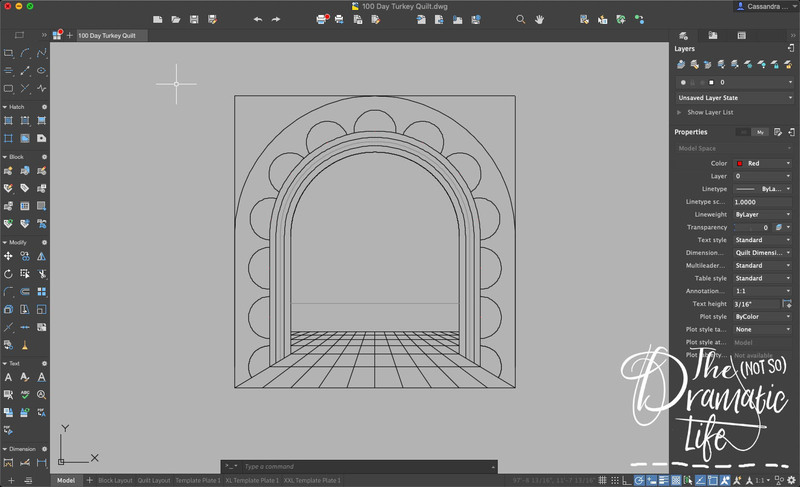 I took a photo of the hand drawn sketch and loaded it into AutoCad to trace over the main lines and insert the turkey into the archway. 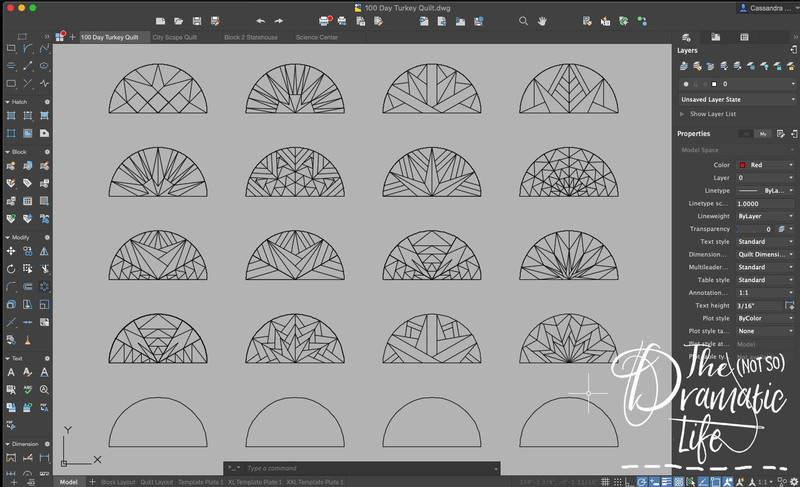 For the semi circles surrounding the arch, I designed a bunch of somewhat formal designs to surround the turkey- I like to think that they all feel a bit feathery to coordinate with the turkey tail. Once these designs were complete, I inserted them into the semi-circles around the arch. 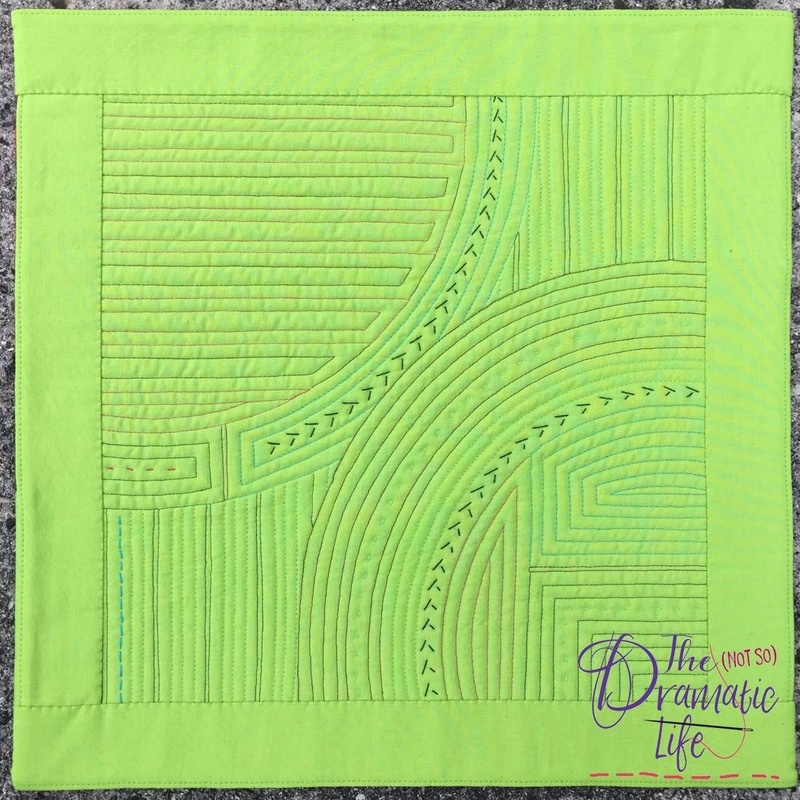 Each these motifs are unique- there are no semicircle repeats in the quilt! 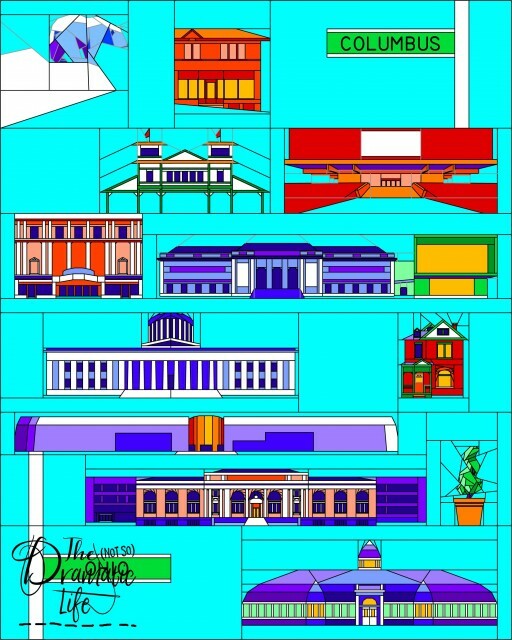 I then finished off the line drawing of the design. By now, I’m sure you are all saying, “That’s nice, but why the turkey?” There is actually a good answer to that. 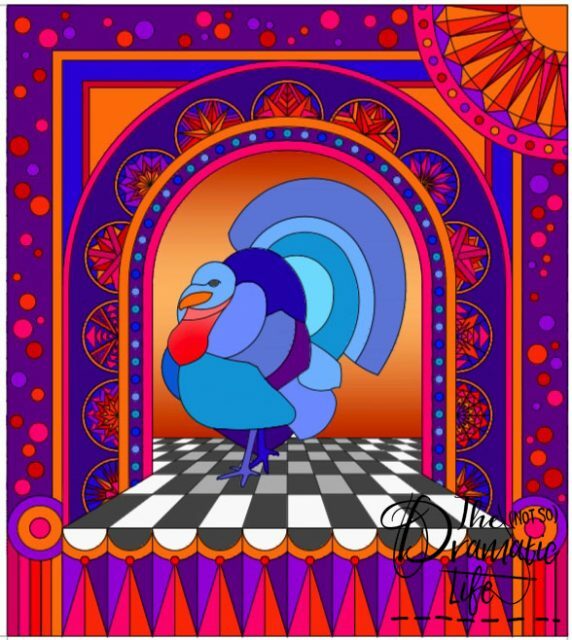 When I was in the primary grades of elementary school, we colored what I am sure was at least 1,000 turkey coloring sheets throughout the month of November. At one point there was a coloring sheet that had no specific directions, so I decided to take some artistic license. I colored a gorgeous blue turkey with every shade of blue in my 64 color box of crayons. As you may have guessed, this did not go over well. I was informed in no uncertain terms that turkeys are brown, and apparently have tail feathers that alternate red, yellow, and orange. From that point on, I never colored anything a color different than what it was “supposed” to be until I entered adulthood. (Come to think about it, maybe my dislike of brown fabric stems from this incident!) Since that time I have always had a nagging feeling that I am doing something wrong when I make recognizable objects an unrealistic color, even though I know logically that it’s really an ok thing to do. 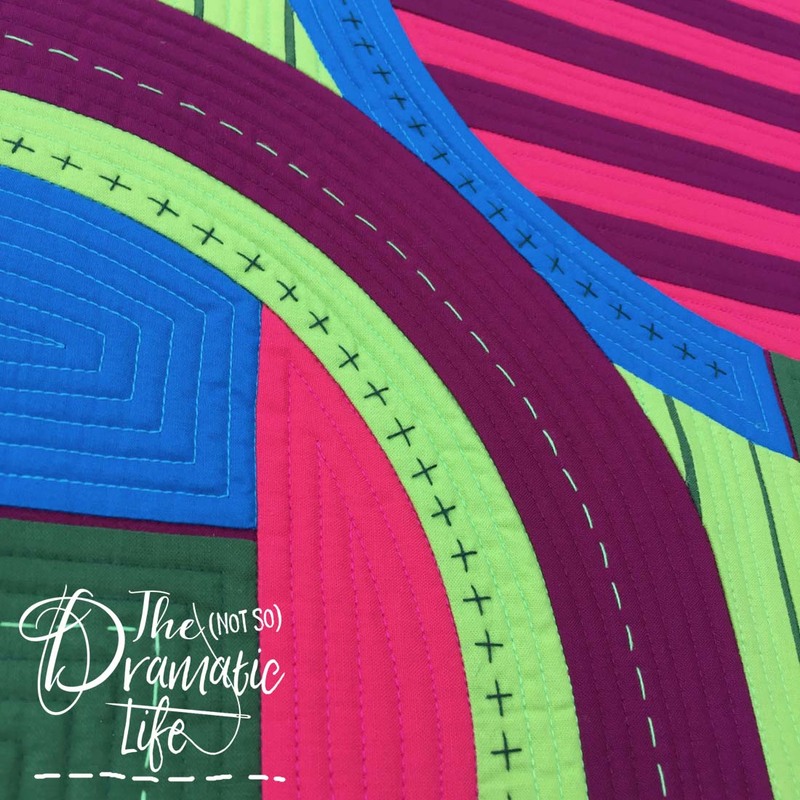 My big hope is that the process of making this quilt will help to squelch those inner demons! So here is the finished design again. It will be constructed with a combination of traditional and foundation paper piecing along with a generous amount of appliqué. 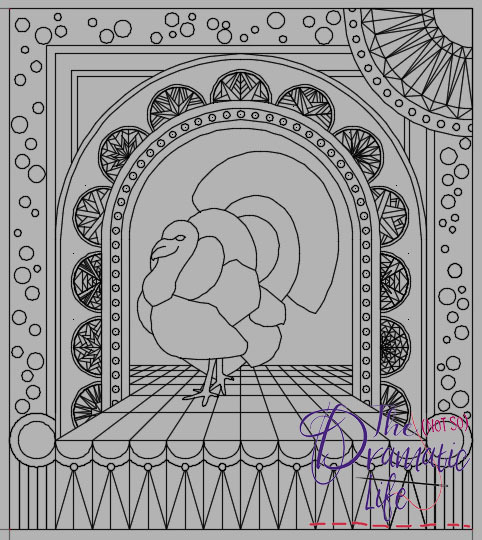 The actual turkey will have a lot more detail once it goes into fabric. 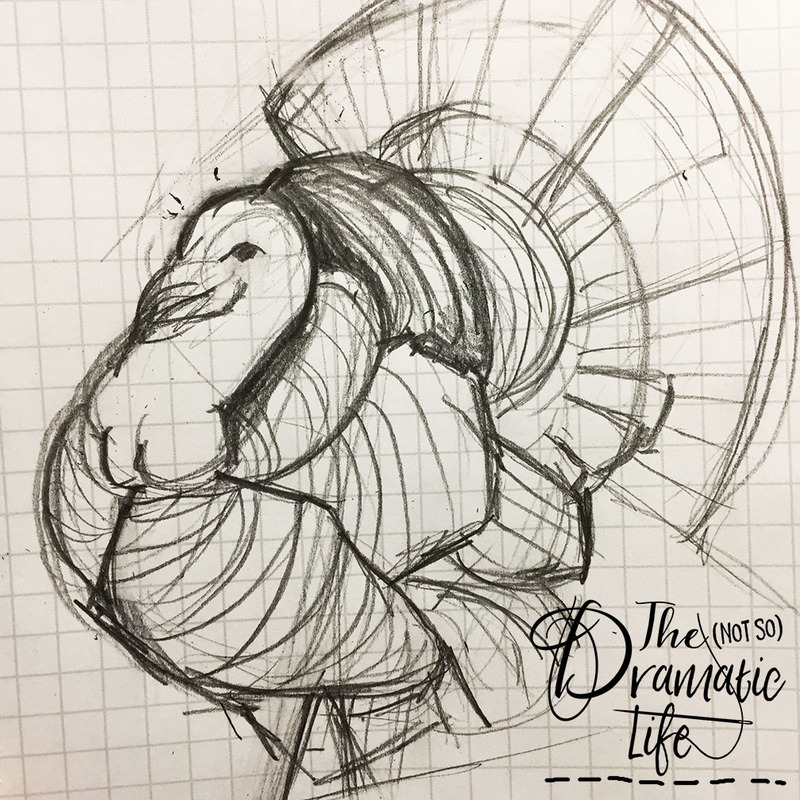 I plan on using the turkey drawing as the general outline, and then getting creative from there. Around the beginning of every year, I like to look back on the previous year. I have usually accomplished more than it feels like I have, and 2018 was no exception. I started the year with a 100 Day project which culminated in Resonance. 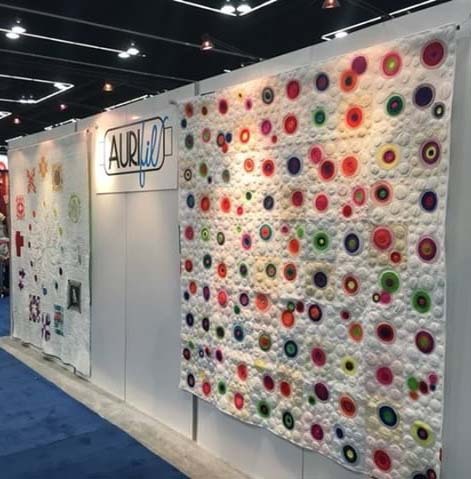 Aurifil liked it so much they displayed it in their booth at Spring Quilt Market. 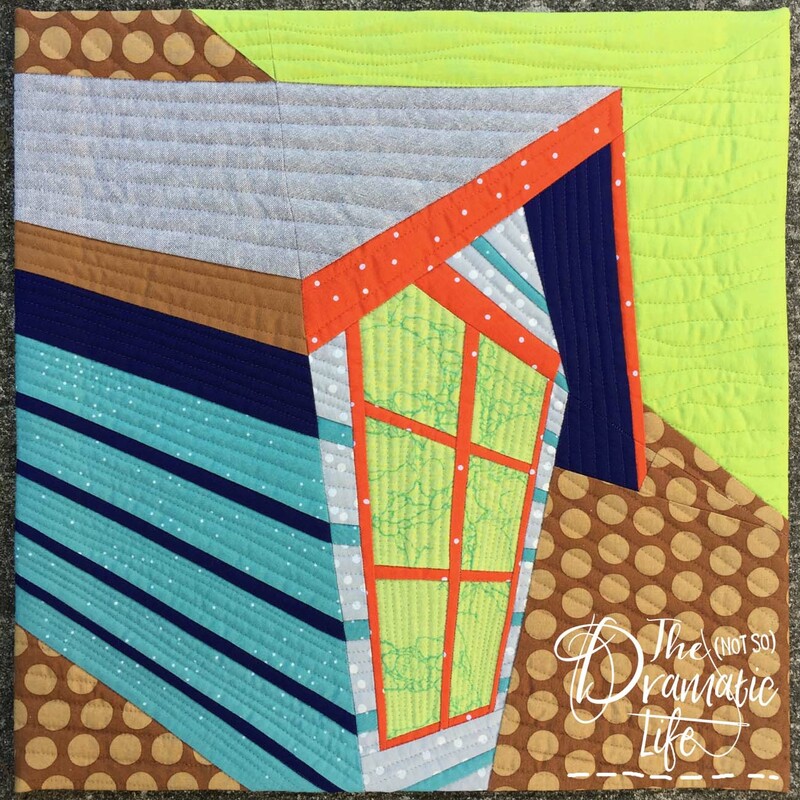 Later in the year, I became an Aurifil Artisan! 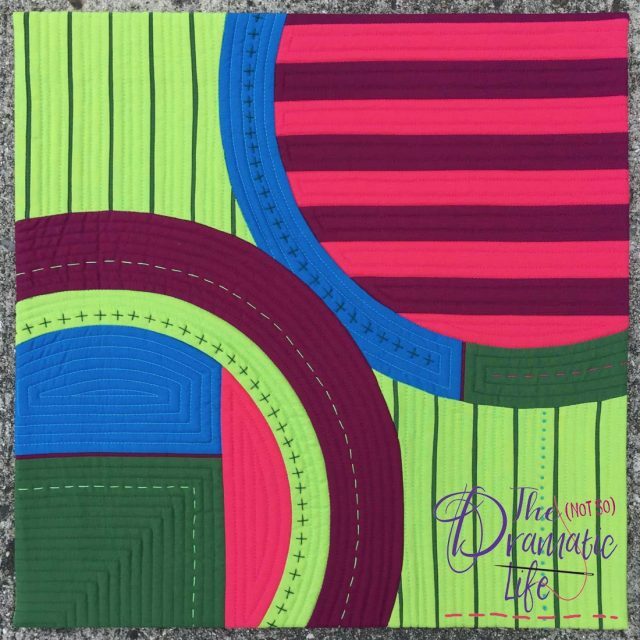 In January, Lissa of LovinglyLissa.com and I finished the QuiltCon Charity Quilt for the Central Ohio MQG quilt that we designed together. 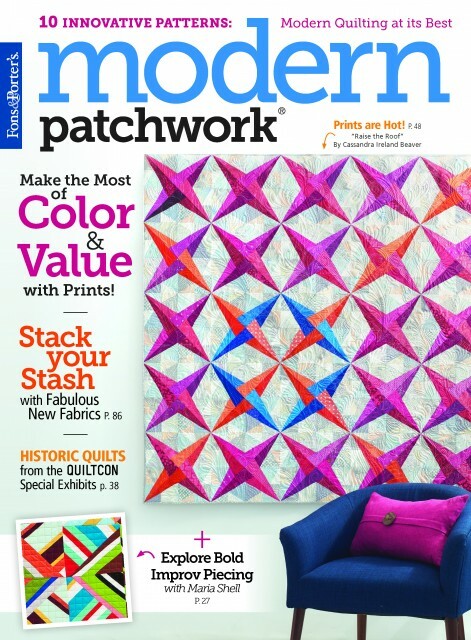 My first cover quilt also came around last year. Raise the Roof is a particular favorite of mine, and it also received a third place at the American Quilter’s Society Fall Paducah Show. 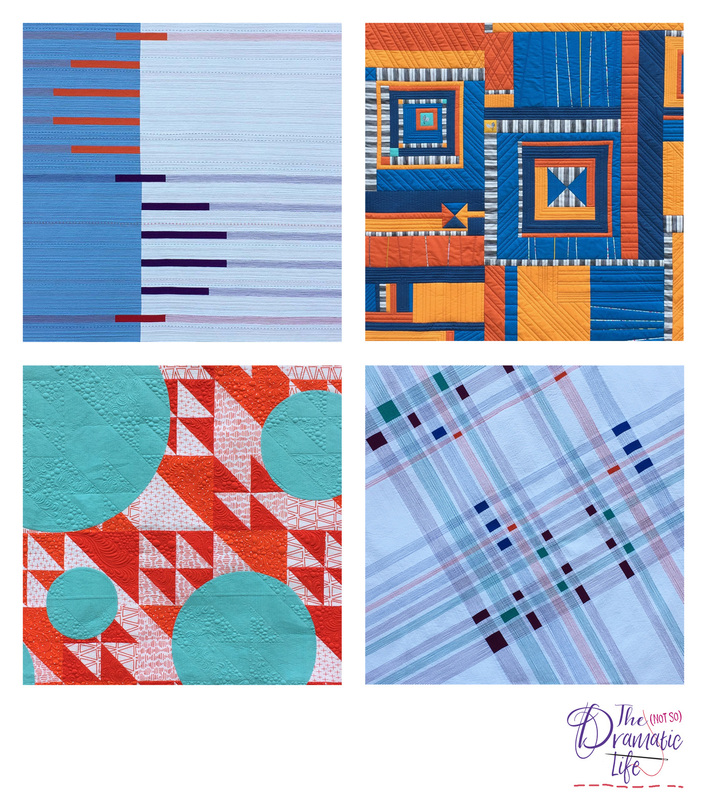 Upward Perspective was a mini made for a Curated Quilts Challenge, and it was selected for inclusion in the magazine! In 2018 I also started my second Block of the Month with Dabble and Stitch in Columbus, Ohio. This year’s quilt has pictorial representations of key Columbus landmarks. 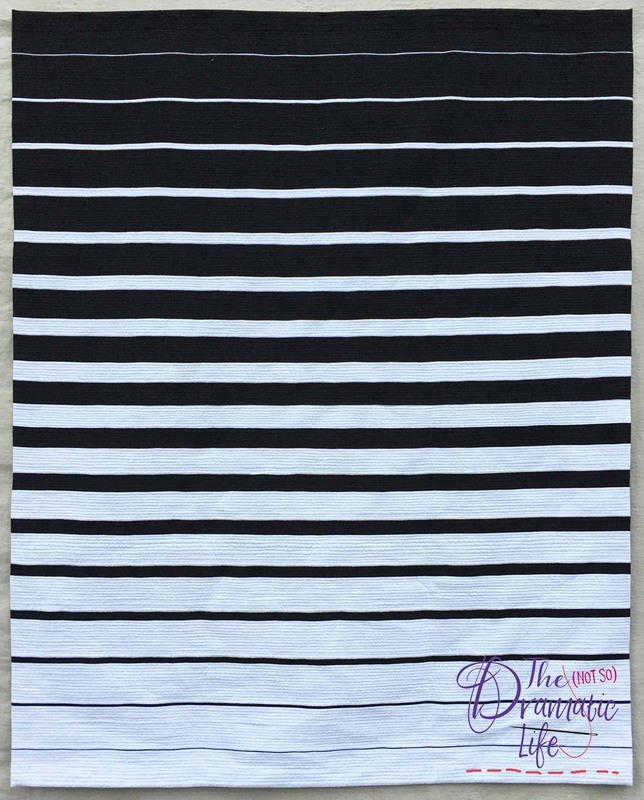 I also designed the 2018 Row by Row for Dabble and Stitch. The theme was music, and I based the block on the state song, Beautiful Ohio. 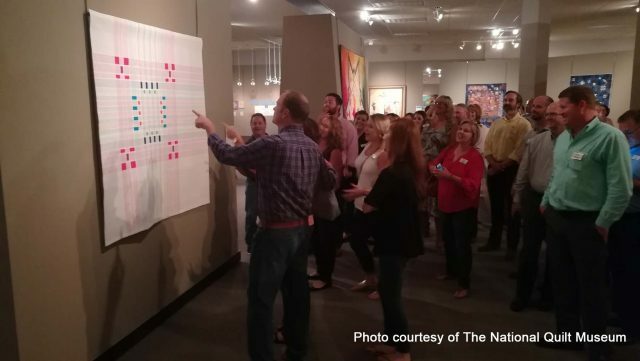 My most exciting moment of 2018 was having my quilt, Infused Plaid, added to the permanent collection of The National Quilt Museum. 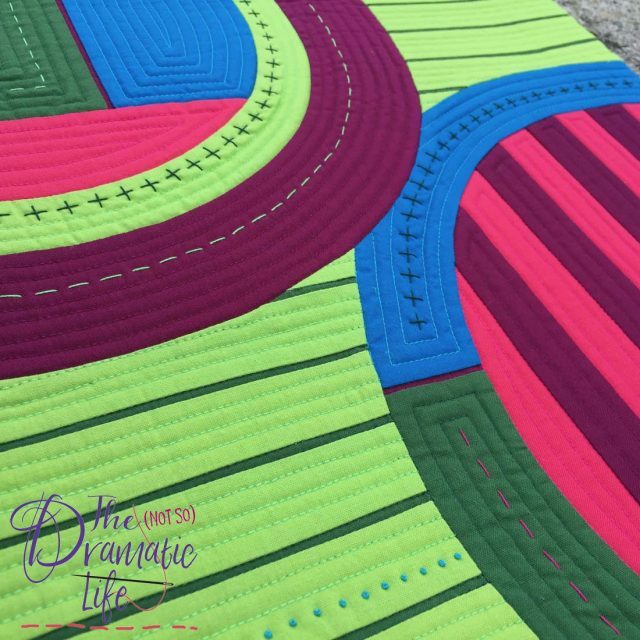 The 2018 colors of the year were Ultra-Violet (Pantone) and Tiger Lily (Kona), and I had a great time putting them together into this quilt! 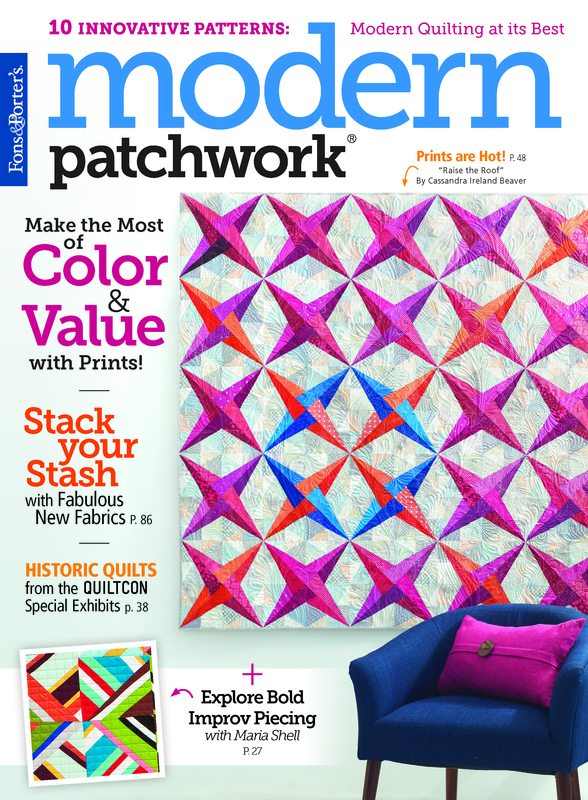 Zenith received a second place in the Modern category at the American Quilter’s Society Fall Paducah Show. 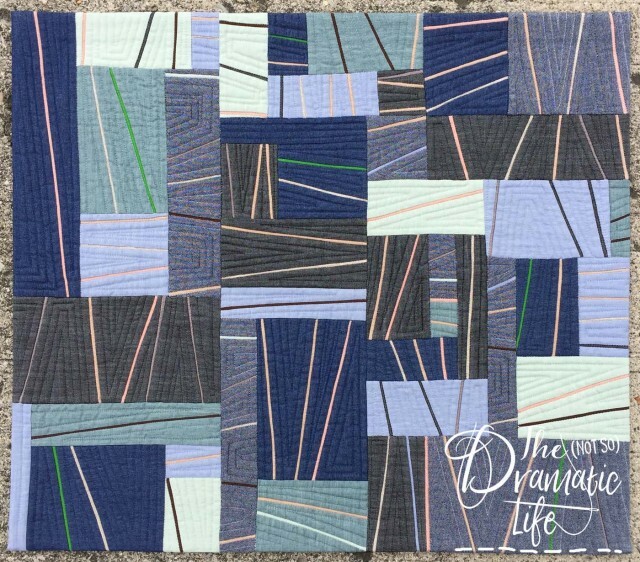 As 2018 drew to a close, I had exciting news that three of my quilts, including Complementary Convergence (below), were selected for QuiltCon 2019! I have added sleeves and labels to them this week, and will be shipping them off at the beginning of next week- now that is a great way to start 2019! 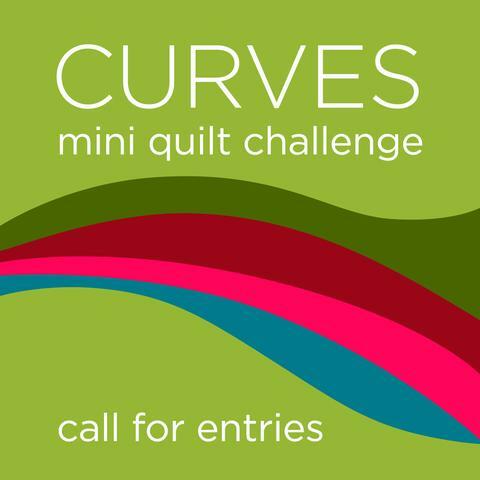 At the beginning of last month Curated Quilts Magazine issued a mini quilt challenge with the theme of “curves” for an upcoming issue. I have been sewing lots of curves and circles in the past few years, so this challenge is a really good fit. The only thing that made it more perfect was the color palette. I already had every color in the palette in solid fabrics and in multiple weights of Aurifil thread. 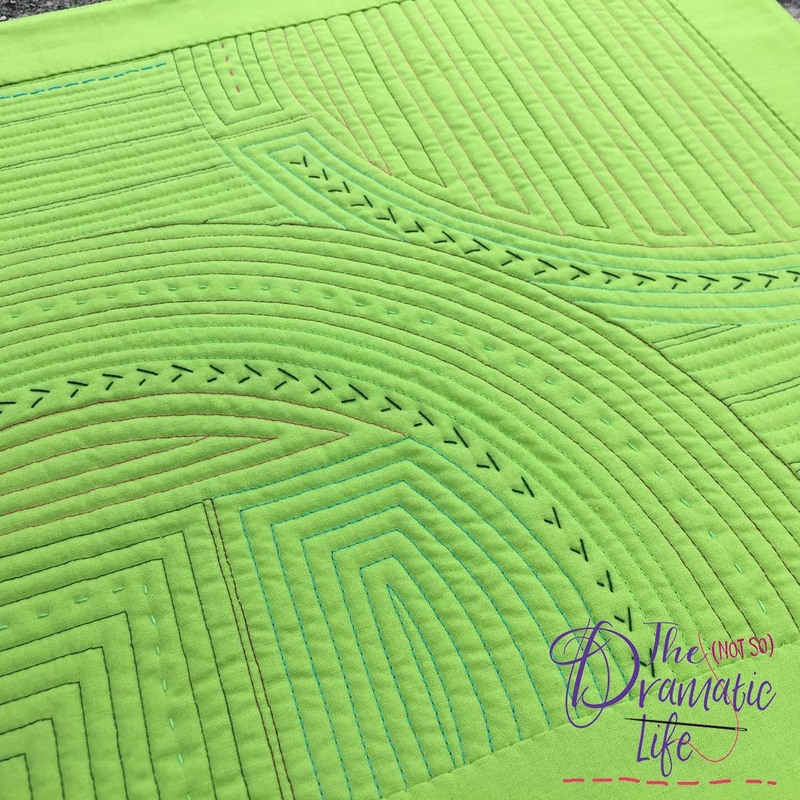 I have been sewing a lot of full circles lately using the Classic Curves Ruler by Sharon of Color Girl Quilts to do the cutting. For this mini I used a similar technique to create partial circles. I also incorporated 1/8″ pieced slivers into the design for added interest. I like the way the piecing adds detail in the all solid fabric construction. Each section is machine echo quilted with 28wt thread, except of the dark green that is quilted in 50wt thread. I left a few open areas to add hand quilted details. The large stitch hand quilting is done with 12wt thread in straight stitches, plus stitches, and a row of french knots. 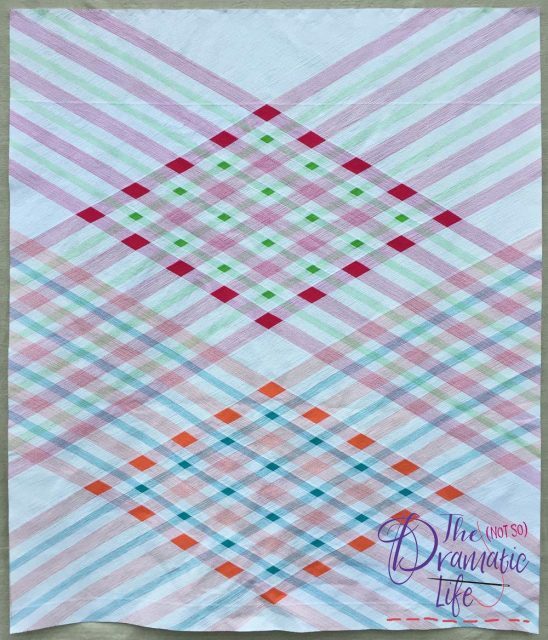 I love how the colorful thread and hand stitching transfers the pieced design to the back of the quilt. The edges of the quilt are finished with facings so the curved design is not interrupted by a binding border. Every year I enter at least seven juried shows, and QuiltCon is probably the one I fret over the most. It is definitely the show that I have received the most rejections from! Thankfully, the jury results come in very quickly for this show- just 17 days this year. There were only 400 accepted quilts out of over 1750 entries. With less than 23% of quilts accepted, it’s like going through the college admissions process each year! I am ecstatic that this year three of my quilts will be in Nashville! Below are all four of my entries with the description I submitted with each. The first three were accepted, and the last was not, but more on that later. Ebb and Flow (51″x64″) is my entry into the Two Color Challenge. Complementary Convergence (66″x78″) is in the Use of Negative Space Category. 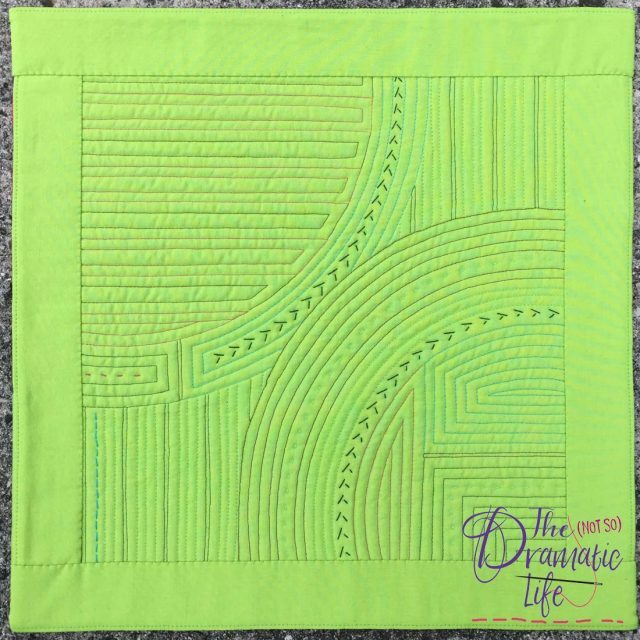 Synthesized Slivers (22″x19″) is in the small quilt category. 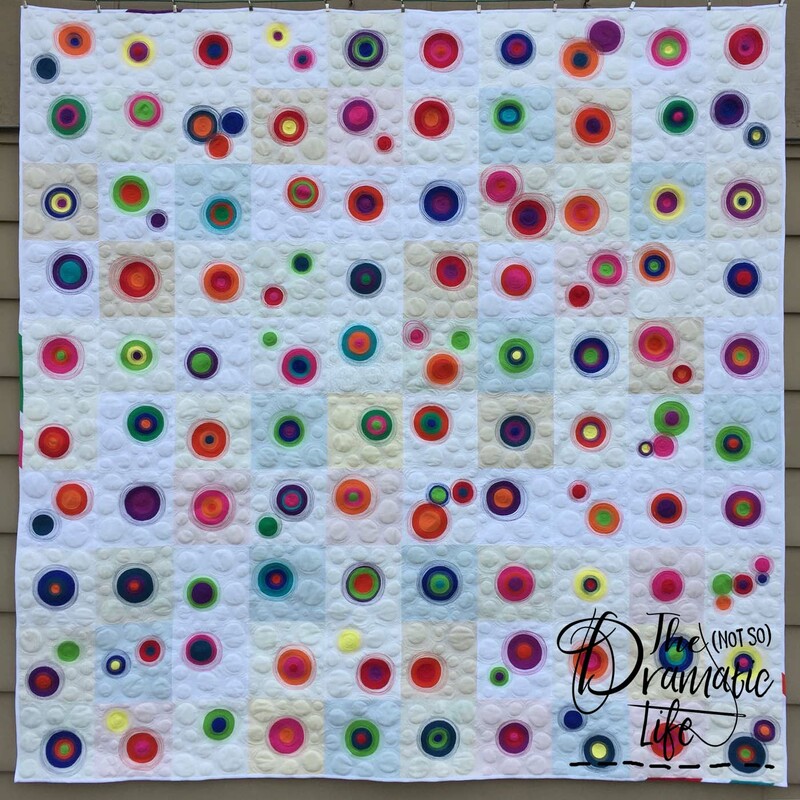 I have entered a small quilt almost every year, and this is the first time my entry in that area has been successful! 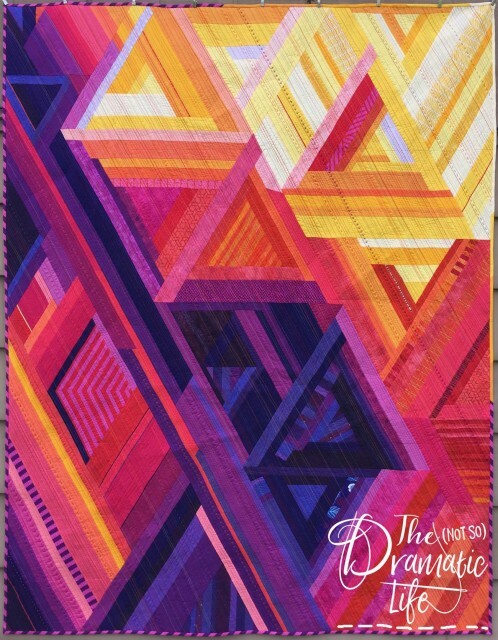 Resonance (79″x79″) was not accepted into the appliqué category, and I’m fine with that. 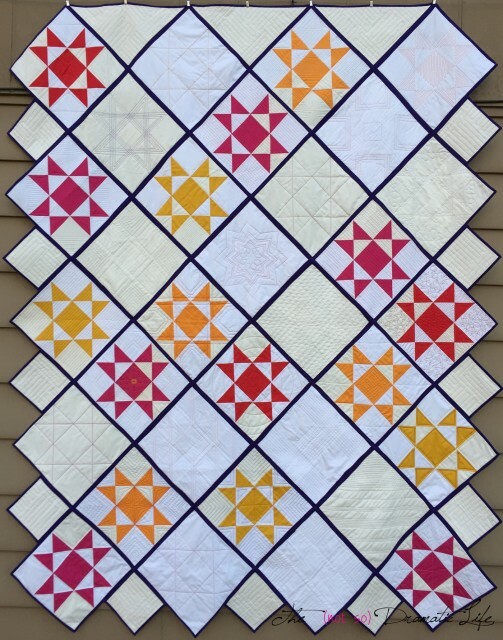 This quilt was completed in April, and was the result of my first 100 days project. 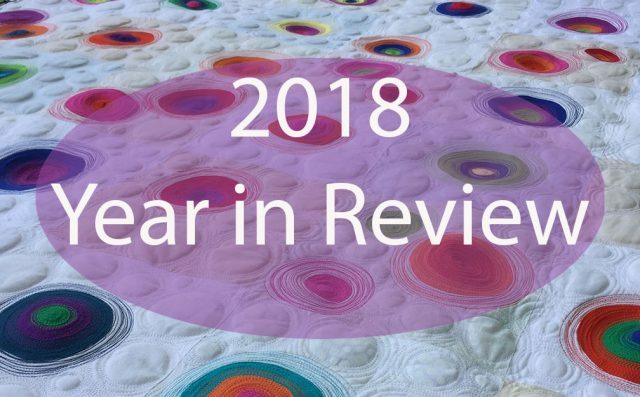 In the eight months since its completion, Resonance has been to Spring Quilt Market with the Aurifil booth, and it was in all three fall American Quilter’s Society Shows. Between these four events, it has been seen by thousands of people already, and I hope some of them were inspired by it! 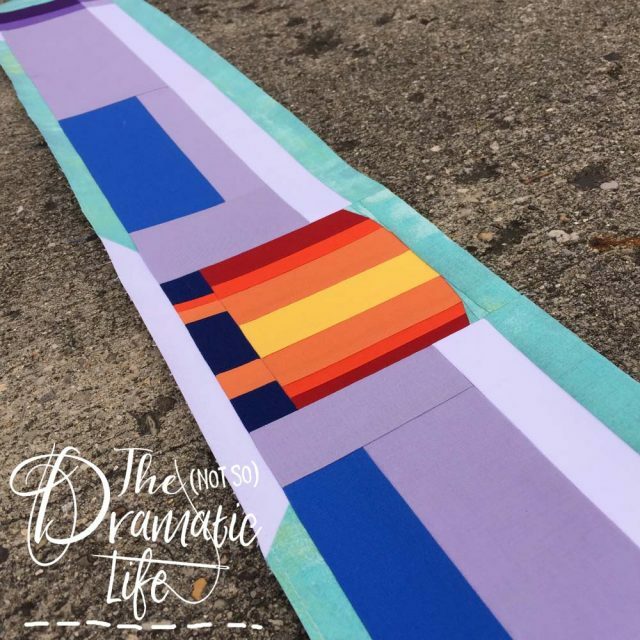 Ultimately, my main hope is that my quilts can inspire others as much as I am inspired every day by the work I see on Instagram, blogs, and in person at my guild meetings. I am so excited for February to roll around so I can see and meet all of the amazing quilters at QuiltCon-whether or not they have quilts on display there!